Cellular serine proteases are most active at neutral, physiological pH and have been implicated in a variety of different processes such as cellular Chemotaxis, protein turnover in tissues, endocytosis and exocytosis, or tumorigenesis (Neurath 1984). In addition, there is also considerable evidence that cellular proteases play an important role in cell-mediated cytotoxicity: T-cell killing can be inhibited by diisopropylfluorophosphate (DFP) or PMSF (Chang and Eisen 1980; Quan et al. 1982), suggesting DFP- or PMSF-inactivation of functionally important trypsin-like proteases. Antibody-dependent cell-mediated cytotoxicity is abolished by protease substrates such as acetyl tyrosine ester in a competitive manner, and by chloromethyl ketone derivatives of amino acids. Macromolecular antiproteases like α 1-antitrypsin and α 1-antichymotrypsin also suppress lysis when present in natural killer (NK) cell assays (Redelman and Hudig 1980; Hudig et al. 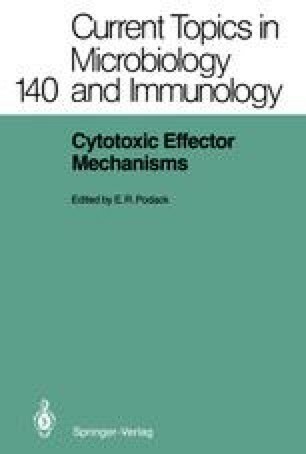 1981, 1984), further implicating the involvement of proteases in the cytotoxic event. While pretreatment of the effector cell with protease inhibitors has no effect on the lytic activity of NK cells, cytotoxicity is highly sensitive to the presence of inhibitors for a short period of time after the addition of the target cell (Lavie et al. 1985), suggesting that target cell binding triggers the exposure of enzymes to the external environment.